This is a St. Patrick’s Day inspired recipe from my friend Lyra at Back on Track Family Chiropractic in Wisconsin. I caught the words “Shamrock Shake” as I skimmed through my News Feed on Facebook and my eyes halted on Lyra’s status which had this recipe laid out, ready for me to try! And no people, this is NOT the chemically created shake that you get from a drive thru window, oh no. This is a health-creating, nutrient and God fat rich energy shake. Thank you Lyra!! It is so good! Add all ingredients to blender and mix until smooth. I didn’t have the chocolate chips on hand, but can’t wait to try (it still tastes great without chocolate)! 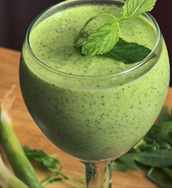 The second time I enjoyed this smoothie this week, I added half of a frozen banana and it was very yummy with the mint. I was looking for a simple St. Patty’s day quote to end this post with and besides a plethora of paragraph sized quotations, I came across this which I will leave you with. Happy St. Patrick’s Day. This was delish! My only modification was that I added some unsweetened almond milk to get it blending. Otherwise it just wasn’t doing the trick. Thanks for a great recipe! Glad that you liked it Rochelle!